Fiat Chrysler Automobiles (FCA) India has announced the festive edition Punto Evo Karbon and Linea Royale for the Indian market. The cars will feature a few cosmetic changes, however, the mechanical bits remain unchanged. These limited edition variants are only available in the Punto Evo 90HP and Linea 125S versions. The Punto gets a new pearl white shade with decals and a blacked out roof. The Karbon badge is located on the C-pillar of the car. On the inside, the Punto gets new black leather seats with contrasting white stitching. The Linea Royale also gets a pearl white shade along with a black roof and gun metal finish alloy wheels. The Royale badge sits below the C-pillar. The interiors are pretty striking to look at. The seats are covered in tan leather and get a cross-stitched pattern. The door pads and dashboard get a similar colour treatment. As mentioned the Punto Evo Karbon gets a 1.3-litre MulitJet diesel motor that churns our 90PS and is mated to a 5-speed manual. The Linea 125S Royale is powered by a 1.4-litre T-Jet motor that develops 125PS and 210Nm. 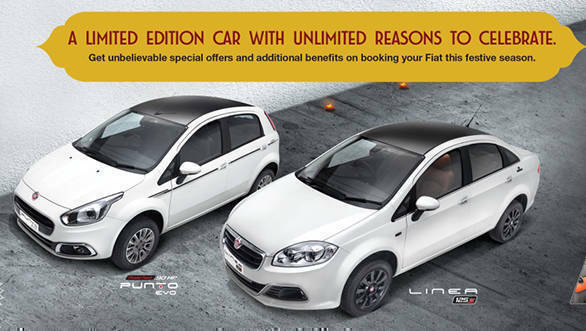 Fiat India has not announced the price of these limited edition variants. We will update this story as soon as we have the price. Fiat India has been slowly but steadily working on improving its products for the country. We drove the Fiat Linea 125S recently and were quite impressed with the performance that the sedan offered. The Linea makes an interesting case for itself as a driver/ enthusiast's car. You can read our comprehensive road test review here.